Manage your work orders on the go with the Q Ware smartphone and tablet compatible interfaces. 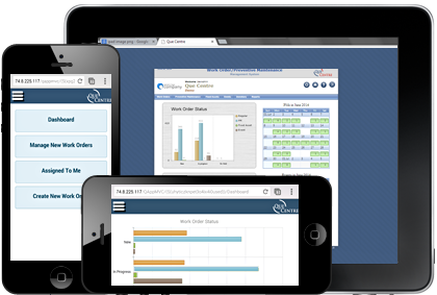 Accessing the mobile optimized platform on log in allows Users to manage the work order portion of the software using an interface optimized for smaller smartphone screens. Our tablet interface offers the same features and functionality as our full desktop version. Users have the option of logging into the desktop or mobile interface at the log in screen. How Can Mobile Work Order Management Help Your Organization? Maintenance technicians can enter and edit work order data in the field making it easy to work away from the office. Managers can easily assign and review completed work orders on the fly. Requestors can create a work order away from their desks and check on its status at anytime.